The values that guide our family were developed long before we purchased the Durham Bison Ranch in northeast Wyoming in 1965. We inherited the core of who we are and what we believe from our grandfather, Armando Flocchini Sr., an immigrant butcher from Italy, who purchased the Durham Meat Company in San Francisco in the 1930’s. A hard working man who loved to hunt, he instilled into the heart and soul of our meat company and later our bison ranch, the values we live and operate our company by today. Working hard, preserving our resources, treating people ethically and fairly, these are the values our grandfather impressed upon us. For the last 40 years, our family has grown our devotion and love of premium specialty meats and sustainable family ranching into one of the largest bison ranches in North America and with Sierra Meat and Seafood in Reno, Nevada, one of the finest meat and seafood distributors on the west coast. Seeing the demand for high quality specialty meat products, raised sustainably and naturally, we decided to branch out and find other families who were practicing what we preach. 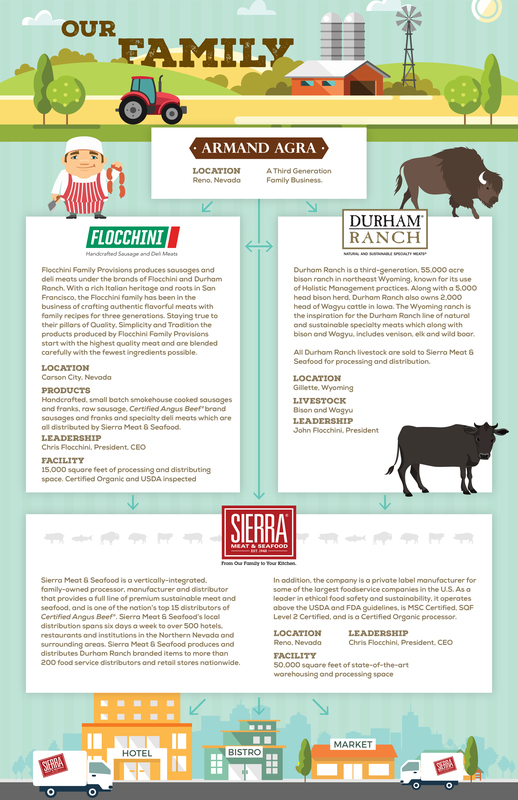 The Durham Ranch brand of specialty meat products is the result of that search. Our products are sourced from small family farms or in some cases grown naturally in the wild. They are processed under the supervision of the USDA by our Sierra Meat and Seafood in Reno, Nevada, as well as in select locations throughout the USA, always under our direct supervision and always to our exact specifications. Consumers today care about where their food comes from. Chefs and retailers are being rewarded by consumers for featuring meat that is natural and that has been sustainably raised. Durham Ranch is answering the call with an extensive line of specialty meat cared for by families on small farms and ranches and by Mother Nature in the wild.